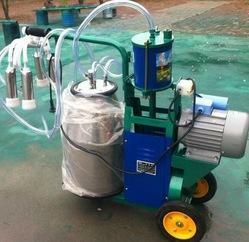 We offer Handy Milking Machine , Double Milking Machine , Petrol Engine Milking Machine. Milk line based automated milking systems, ranging from a simple 3 station parlour to large herring bone parlours bundled with cow identification, automated milk meters, cluster retrieval and milk sampling – enabling Udder-to-Cup clean milk production protocols. This is India’s first 8-point Community Milking Parlour, deployed by Stellapps for Kolar Milk Union Limited (KOMUL). 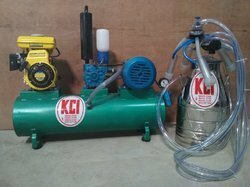 We are marketing Milking Machine Under brand "Govardhan" and till date we have sold more than 2500 machines across India and abroad. We have our set up and well established manufacturing Unit. In this type, machine is Fixed at one place / corner and for vacuum, pipeline is used."